PREMIER® CORE-LOKT® ULTRA BONDED is a bullet in a class of its own. It the first and only bullet to successfully maximize the best features of two great types of hunting bullet construction. It delivers the extreme accuracy and retained energy you would expect from a tipped bullet, in combination with the outstanding penetration and weight retention that only a bonded non-tipped bullet could deliver. This unique design provides the hunter a Premier bullet that yields devastating on-game performance from 50 to 500 yards. Premier Core-Lokt Ultra Bonded - the new standard in high-performance hunting bullets. Core-Lokt® Ultra Bonded expands reliably at all reasonable hunting distances. 30-06 SPRG, 150-gr. 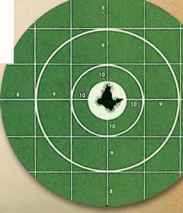 Premier® Core-Lokt® Ultra Bonded, 5 shots, .6", 100 yds. More accurate. Our unique manufacturing process eliminates jacket stretch for near-perfect wall thickness which results in better flight stability. More versatile. A 20% heavier jacket engineered with an innovative wall profile provides better expansion and penetration over a broad range of terminal velocities. More reliable. 50% thicker Core-Lokt section increases mechanical locking of the rear core into the jacket and better controls expansion at higher velocities. More deadly. Bonded jacket/core design further insures controlled expansion (2x diameter) with up to 95%% weight retention for ultimate on-game performance.